Good morning everyone, welcome to my blog, this morning I am sharing a card created for Tonic Studios Rococo plus music die sets that were launched on Hochanda last night, lots of shows scheduled today with Jodie, so lots of inspiration and beautiful samples from the team. The card base and layers are cut from the Victorian Layering die set, musical notepaper from my stash of papers. The microphone die has a backing die as these die sets are the Rococo plus which gives you 2x dies to each set this backing layer was die cut in Nuvo Black gloss craft perfect mirror card and then the detail die was die cut in craft perfect silver Mirror card and glued flat to the backing die, make sure you only add a small amount of glue as the mirror card will get messy and mark where the excess glue is, you then need to cut the detail die again in the silver satin craft perfect and then bit by bit paper piece the microphone this is then added to the card with 3D foam pads and then placed on the card. 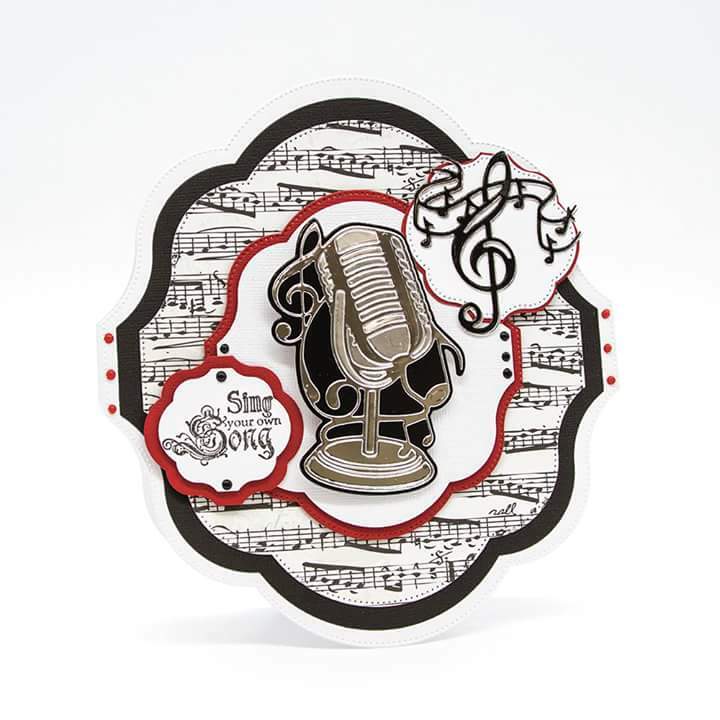 The card is then embellished a little further by adding a beautiful musical note from a previous music die set from Tonic and a stamped sentiment from my own stash and then finish the card with Nuvo red berry Crystal drops.